LUXOTIC NC with Guillotine V2 is one of my e-cigarettes. I have a lot of high-power e-cigarettes, but this product makes me deeply love. Although it has no cool LED designs on the market, I'm in love with its Old-school Style. Yes, we can all see that many new electronic cigarettes are now colourful LED designs. Settings can also set different lighting colors. But I don't know why. I just don't like it. I know that's not what I want. When I first saw this product, I was attracted by its unique appearance. 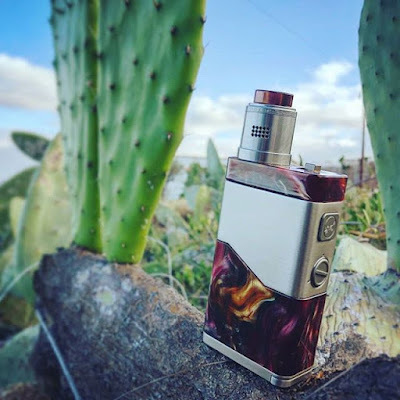 What is the LUXOTIC NC with Guillotine V2 vape kit? This is a product of a mixture of resin material and stainless steel, and its workmanship is very fine. I can even observe every detail of the design, perfect. I think the other attraction I have is its control experience. This is a device without a diaplay, but it does not affect the fun it brings. With a voltage-free adjustment knob on the side, you can freely park the voltage at your favorite spot. And the feeling of the knob is really much cooler than the electronic adjustment. I feel like I can play all day. There is a switch on the top of this product, which can only be easily adjusted in parallel and series mode. If you want to experience the shock, it is that simple. It is really a unique product and it has its own style. I think someone will feel the same special as me.